A few weeks ago, while I was running around at work, one of my vet nurses put a phone call on hold and asked me if it was okay for her to give out my email address to the caller associated with IFAW (International Fund for Animal Welfare). I wasn’t really familiar with that group and we weren’t sure what it was regarding but I told her it should be fine. I arrived home pretty late that evening and started going through my emails. My attention gravitated to the IFAW email. I was suddenly struck with curiosity and quickly clicked on it. As I started to read and understood the impact of the content, I crumbled into an emotional mess and tears instantly trickled down my cheeks. I was flabbergasted to say the least. I was one of the ten winners that had been chosen from Australia–wide nominations from friends, family and work colleagues of people who do exceptional work to benefit wild or domestic animals. 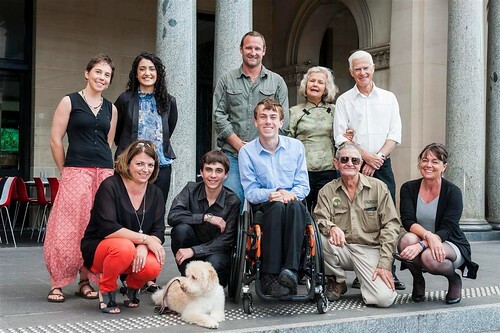 I was invited to receive my award officially at Customs House in Sydney only 6 days later. It was pretty short notice and I was petrified I wouldn’t be able to go because of work commitments. Thankfully my bosses were very supportive and gave me a day off to hop on a plane and fly to Sydney in the middle of a very busy schedule. 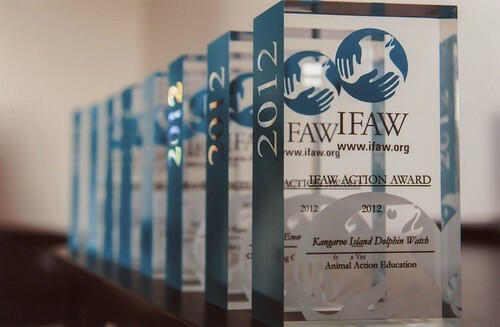 On the 21st of November 2012, I attended the IFAW Australian Animal Action Award Ceremony and I felt very privileged to be amongst so many people with a great passion for animal welfare. 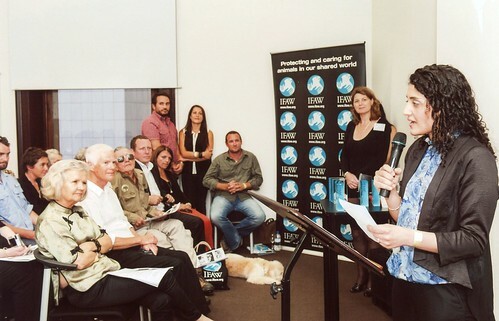 Isabel McCrea, the director of IFAW Australia, made a terrific opening speech about the event and updated us all about IFAW’s global achievements in animal welfare in 2012 with the aid of images. I was quite impressed with all the work they do and their amazing dedication to promote animal welfare in the field and in the legislation. She then gave each and every IFAW Action Animal Award Winner a great introduction and presented them with their Award and gave them an opportunity to make a speech. During that time, I was captivated with the achievements of all the fellow award winners and was mostly touched by Daniel & William Clarke. They received an award in the category of young animal welfare campaigners. These two young boys have raised around $650,000 to save the orangutans. They have even co-written ‘Tears in the Jungle’, a book which documents the brothers’ trip to Borneo, with all proceeds going towards saving the orangutans. I was sitting next to their very proud parents and absolutely felt every tear that streamed down their father’s face. He told me that his sons were quite shattered by the tragic passing of Steve Irwin and that inspired them to raise money and awareness about the orangutans They had told their dad: ‘Now that Steve is gone, who is going to look after the Orangutans?’. I am a huge supporter of these young boys and they gave me a lot to think about. You must check out their blog, Tears in the Jungle and promote their amazing work. Then my name came up and I sat there listening in awe to the very honorable introduction that Isabel made. 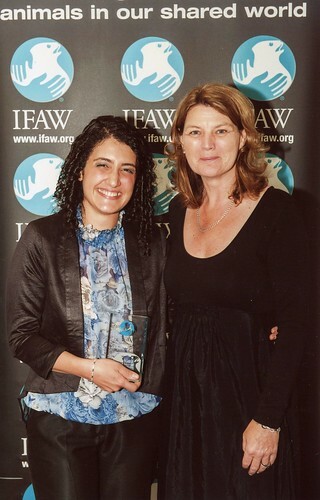 “Dr Rayya T-Malaeb from Victoria, has been recognised for her dedication to animal welfare by being awarded a prestigious IFAW (International Fund for Animal Welfare) Action Award. 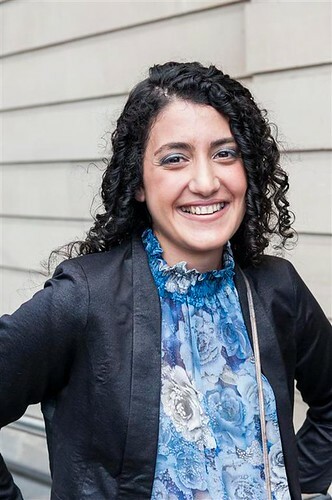 Rayya T-Malaeb works at Vets All Natural in Victoria and if treating an assortment of dogs, cats, horses, cows, birds and native wildlife didn’t keep her busy enough, Rayya is now one of Australia’s most prolific bloggers! Through her blog and Facebook page, Rayya educates and informs her followers and fans on a range of animal welfare issues. She really connects to pet lovers/owners all the while giving tips on how to care for all sorts of animals, optimising the best of caring and responsible vet practice. By maximising social media Rayya has not only become a friend to many, she provides invaluable advice and guidance. As I got up to accept my award, I was just full of raw and very deep emotions. I was very moved with Isabel describing my social media work as an outstanding contribution to pets around the world. My opening words were: ‘Wow, oh wow, I’m speechless and believe me I never usually run out of things to say!’. I went on to thank IFAW for this great and very heart-warming event and described my blogging journey. Of course, I couldn’t contain my tears towards the end of my speech. When the official ceremony finished, the brilliant event didn’t end there. In fact, that was when I finally got the opportunity to mingle with everyone. 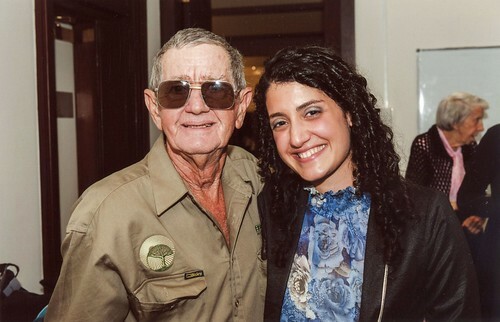 I couldn’t stop myself from running to Bob Irwin, father of late Steve Irwin, who had also received an award for his lifetime dedication to animals. I had to shake his hand and it felt like such an honor. I again of course couldn’t stop crying while I was talking to Bob as I was quite star-struck! I spoke to people from all walks of life that have been instrumental in their contributions to animal welfare. It truly was one amazing night that I will never forget. I flew back to Melbourne the next morning and got into the swing of things. A few days later I was briefly interviewed over the phone by a local journalist about my award. And before I knew it, I was in the local newspaper with an empowering heading: ‘Popular Vet wins Top Award’. Rayya – A Heartfelt congrats. What a way to end a year and I am sure it gives you a great boost and cheers to more of the same in 2013! Someday maybe we can meet – I love you already as you remind me so much of my vet friend, Dr. Marla Menuskin from Chicago. She no longer practices and had to retire early due to a diagnosis of lung cancer (she is around 50). She was my vet for so many years before I moved away to marry my husband. I started with her when she was RIGHT out of vet school at Blum Animal Hospital. I told her right away that she should have her own business. She and another vet later started Family Pet Animal Hospital in Chicago and it is still doing a brilliant busibess. I am proud of you!!! Nice way to end the years. All the best for an even better 2013. Congratulations Rayya on a very well deserved Award and public recognition. Being passionate about your work and the pets in your care is reflected in your Blog (& even more in the brief day we met in Melbourne when you brought your own dogs down to the beach for me to photograph). Best Wishes for 2013 and many more years into the future. Great job, love your quote at the end. How nice to hear of a good work get recognized. Thank you for sharing. Well deserved, Rayya! Good for you. So happy for you. Keep up the good work. Congratulations Rayya! Your award rightly deserved. I find your blog very interesting, educational, and informative. Keep up the great writing. Congratulations on a well deserved Award!! Congratulations. I love reading your blog and I think for you to take the time to post such detailed and informative……..not to forget heartfelt ……..accounts of the work that you do with animals is amazing. You deserve the award so very much. Congrats on an awesome award. I am not surprised because your caring and passion for the animals in your care shines through your postings. I am struck that while you care so deeply, your advice is so reasonable and sound. I love it so much when people do well by doing good. Thanks so much by sharing your experiences with us. We all learn a lot and are often amused and entertained as well as educated. Fantastic and looks like it was very much deserved. Thanks for sharing the story about the Orangutang guys.. Sounds pretty cool! My sincere congratulations on the IFAW Award Rayya – what a way to end the year! It must make you feel good inside knowing that all your hard work is recognized, doing what you love most, and I am so proud of your achievement. You truly deserve this award , all the very best RAYYA . The world needs more people like you . GOD BLESS YOU . Many congratulations, Rayya – you are so deserving of that award, and I am thrilled for you! What an incredible experience for you, and I can imagine how moving it must have been. I will also check out the Clarke brothers’ blog. Well done, again! congratulations THANKS for sharing the love……..GR8LISTENER is your newest fan. Congratulations to you and for the two boys! 🙂 Happy New Year of 2013 with Good Health and Progress! Congratulations Rayya! I am an IFAW supporter. This is a well deserved award. Congratulations! Nice to be recognized for all your good work with animals. Congratulations! Well-deserved, I might add. Thank you for all you do for our furry friends. Congratulations on a well-deserved honor! Although I don’t always comment, I enjoy reading your blogs and truly enjoy the way you translate your life in the veterinary clinic–highs and lows–into words and photos. You do a great service to your profession and to the animals! I am sitting here with a big grin on my face. Kestrel and I are very proud of you, Rayya! Congratulations – as someone else said above, what great way to finish off the year! What an achievement Dr. Rayya!! I’m so happy for you. And so proud to ‘know’ you!! Congratulations and I hope it’s just the beginning of many more for you! 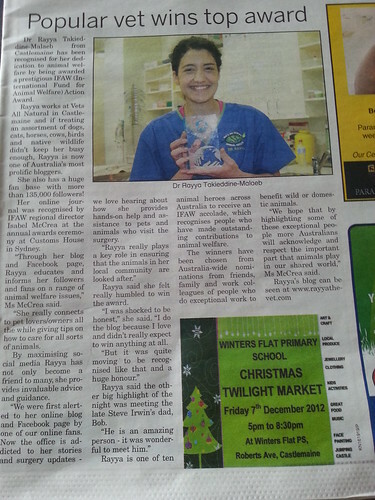 Congratulations Rayya – well deserved – your passion for animal welfare obviously shines through and it must be nice to be recognised for it. I look forward to reading more of your great posts.